Hands on: Samsung Galaxy Note 3 review | What Hi-Fi? The Samsung Galaxy Note. Everyone seems to have an opinion on this larger than life phone range, which started the trend for supersize smartphones. And, having taken over Times Square and part of IFA 2013 in Berlin for a rousing international launch, the Korean giant has finally taken the wraps off its third generation 'phablet,' the Samsung Galaxy Note 3. Highlights of the new Note 3 handset include a Full HD Super AMOLED screen, a new S Pen stylus which uses a revamped control system and, to satisfy us audiophiles, 24bit/192kHz high-res audio support. Where do we start? The Samsung Galaxy Note 3's screen is 5.7in. The display has grown a whole 0.2in in size compared to the Galaxy Note 2 (Note 3 on right above), but the phone's physical height and width hasn't changed. How? Samsung has trimmed the bezel to within an inch of his life, thus allowing for that extra fraction. Samsung has also sliced 1.1mm off the thickness of the handset – it''s now 8.3mm –and dropped its weight by nearly 20g. 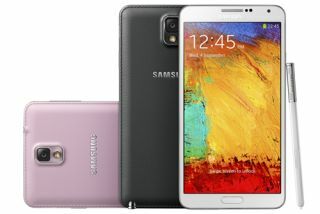 The Galaxy Note 3 comes in two flavours running two different processors: an LTE model rocking a 2.3GHz Quad-core processor and a 3G version running a 1.9GHz Octa-core (similar to the variation in Galaxy S4 models). There's a 13MP rear-facing camera, featuring new stabilisation tech and a new LED flash. Powering the device is a large, 3200mAh battery. Finally, the handset runs Android's Jelly Bean 4.3 operating system out of the box and comes in 32GB and 64GB capacities. Of course, the memory is expandable should you slot in a microSD card. Samsung has given the Galaxy Note 3 (left, above) more than its fair share of design tweaks. Galaxy devices such as the Note 2 and S4 have come under some criticism because of their plastic back covers. In many eyes it cheapens the look and feel of those devices. A number of colourful cases will be on offer at launch (Note 3 on right, above). The S View covers have been designed so you can see more of your notifications as well as give your stylus more screen to play with when the cover's on. The S Pen stylus has been redesigned and the way it interacts with the note significantly tweaked. Pull out the S Pen or click and hover it over the screen and you trigger Air Command – t's like a virtual click-wheel which can be navigated by just hovering the stylus on the screen. You can then select different options for executing a variety of different tasks such as writing over screen grabs and organising your scrapbook. We managed to fire up the Note 3's YouTube app and play a couple of quick video clips. First impressions were promising. There seemed to be more detail on display (which you'd assume is partly down to that Full HD Super AMOLED screen), while black levels seemed deeper – the whole picture seemed more natural compared to the old Note 2 that we had on hand for a quick comparison. It'll be interesting to see if this still holds true when we get our hands on a full production review sample. The extra screen estate is subtle when compared to the Note 2 but you're still aware of it, especially with the thinner bezel. Samsung made a particular point that the new Galaxy Note 3 supports "Ultra High Quality Audio" (or 24bit/192kHz files to you and me). Perhaps due to the fact great rivals LG stole a march with the launch of its hi-res audio toting LG G2 phone, which has since been followed by a Sony Walkman which supports HD music. We also grabbed a chance for a look at the Samsung Galaxy Gear smart watch. The Galaxy Gear samples were pre-production, so functionality was limited. The design of the actual watch seemed perfectly acceptable too, and not the cheap-looking trinket that some of the gathered press had feared. It's going to be interesting to see how the Samsung Galaxy Note 3 is received, amongst current Galaxy Note 2 owners and non-users alike. The new textured finish is certainly one of the big talking points. But, it's obvious Samsung has tried to concentrate on making the new Note as intuitive and useful as possible.